Factropolis -- A Fun Fact Every Day! : First Lady Eleanor Roosevelt was so convinced the White House was haunted that she kept a vial of holy water on her nightstand. 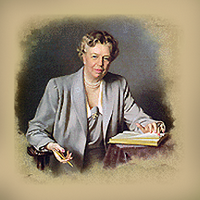 First Lady Eleanor Roosevelt was so convinced the White House was haunted that she kept a vial of holy water on her nightstand.